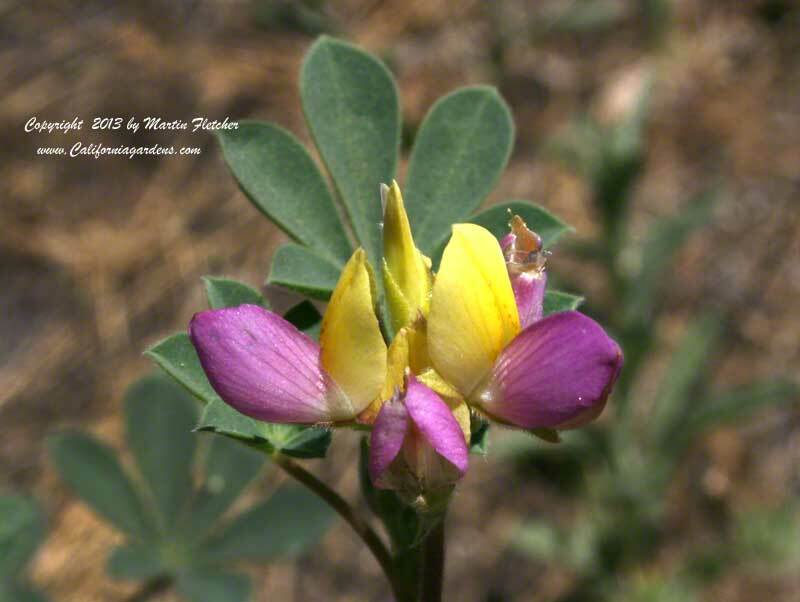 Lupinus stiversii is exceptional for the yellow and pink coloring. Lupines are mostly blue or dark purple and white. The Harlequin Lupine grows in the foothills up to the lower pine forests in California. The original specimen was collected near Yosemite. This photo of Lupinus stiversii was taken near Hetch Hetchy reservoir in Yosemite. Lupinus stiversii grows to 6-10" tall and can be spreading. Flowers of the Harlequin Lupine are produced from Spring into early Summer. Wildflowers that require no supplimental water are a great way to expand the reach of the Drought Tolerant Garden. It is best to spread seed with the first significant rains in the Fall. Lupinus stiversii is a nectar source for the Orange Sulphur Butterfly and deserves a place in the butterfly garden. Pink and yellow flowers of Lupinus stiversii - Harlequin Lupine. High resolution photos are part of our garden image collection.